NEFs edited in Capture NX2 are not supported. If you try to send a NEF file edited in CNX2 to Photoshop or another editor, nothing happens. You get a brief progress bar, and then… nothing. You will need to use Capture NX2 to export TIFF copies of your edited images. Capture NX-D has no local editing tools. There are no brushes, no gradients, and no Control Points in Capture NX-D. You’ll need to use Photoshop or another pixel editor after making global adjustments in Capture NX-D.
You can send images to Capture NX2, but doing so first converts them to TIFF format. Also, you can’t choose to automatically (at least I couldn’t find it) place TIFF copies in the same folder as the originals. Image metadata are a non-industry standard. Metadata are stored in proprietary (read: not compatible with Lightroom, Photoshop, or Photo Mechanic) sidecar files, which are stored in a completely different folder as your images. Capture NX2 may still be for sale, but it won’t support new cameras like the D810. 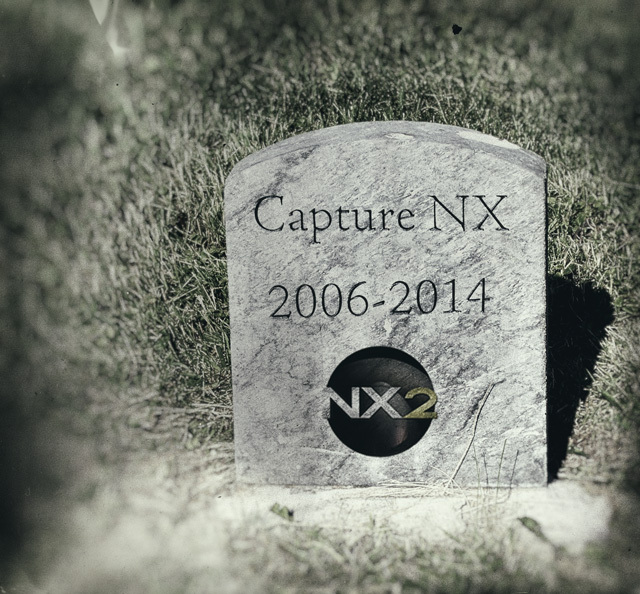 It’s not clear how much longer Nikon will support Capture NX2. During the beta-testing phase, Nikon indicated that Capture NX2 will not be supported/developed after the final release of Capture NX-D. This strongly implies no maintenance releases, bug fixes, or future OS compatibility. If something in CNX2 dies, you’re going to be stuck. Consider yourself warned! Capture NX-D is a basic, global adjustment only, raw processor for Nikon NEF files that will give you the same look as an in-camera JPEG. That’s about it. It’s only value would be to have a raw converter that supports the latest Nikon cameras until the other guys (Adobe, Capture One) offer raw support for new models. Capture NX-D is essentially a replacement for View NX2 (and it’s definitely an improvement that, other than the proprietary metadata issue). For workflow and editing, there are better options out there in my opinion. With the recent announcement from Apple that Aperture is being discontinued this fall and merged with iPhoto into a new program called “Photos,” your two choices right now for professional image workflow products are Adobe Photoshop Lightroom or Phase One’s Capture One. Both do a good job converting NEFs. I chose Lightroom in late 2012 for numerous reasons, not the least of which was its ability to emulate Nikon Picture Control color. – which program you would consider to replace NX 2 ? – can I still install NX2 in the future on a new computer or would that be a problem? You can keep a copy of Capture NXD around, but given its limitations I recommend moving to Lightroom. It has so many more robust image management features and the RAW converter works just fine for my Nikon NEF files. As far as future compatibility with Capture NX2, it’s unclear as to what Nikon is doing here. They announced that they would not be supporting it once NX-D came out, and that is certainly the case with the respect to adding new camera support. However, Nikon continues to sell the product as an image editor (presumably you send a TIFF from NX-D to NX2 for editing), so I’m not sure what their intent is. I want to best software for global adjustments period! And thats what NX-D is for. That’s it. LR and other third party software companies do not have the exact recipe for “cooking the sauce”. You can come close, but not perfectly on target. So the question you have to ask oneself is : do you really want to hit the target or Just come close? Any differences between current, modern RAW converters come out in the wash during normal adjustments. The only value of NX-D is to get RAW images to match out of camera JPEGs. And the workflow hit is tremendous. You cannot typically finish an image in NX-D, but you CAN finish a RAW image in software that includes global and local adjustment tools. You’re therefore *forced* to export a TIFF and edit in PS or another external editor for every image that requires a simple local adjustment. That’s a massive file storage penalty, IMO.